These methods work best for tools with a cutting edge, to read about saw files, click here. There are several types of abrasive materials you might come across when looking for something to sharpen your edge tools on, these range in price which makes some options more suitable for beginners than others. For abrasive material, the larger the grit number, the finer the surface. These can be either natural or man made, they are durable and long lasting but will hollow over long term use which means the surface won’t be flat and may therefore be unsuitable for aspects of sharpening such as abrading the flat sides of tool blades. 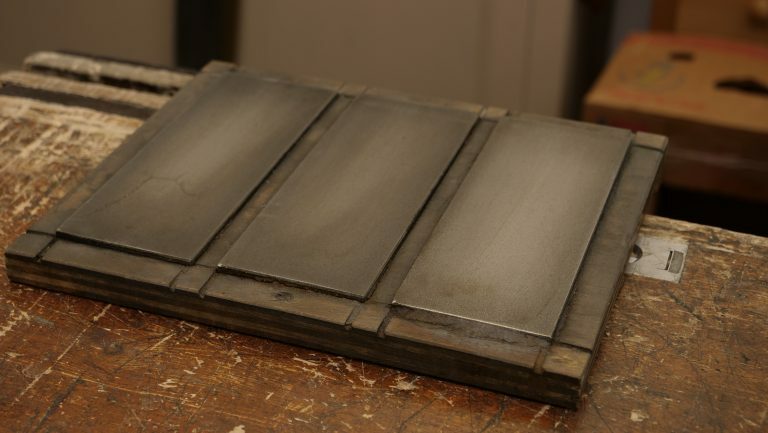 Before use you must flood the oilstone with light machine oil before sharpening, this will stop the surface of the stone from clogging with residue from the abraded steel and sharpening particulate from the stone fracture. Without oil the stone’s surface will become glazed and thereby unusable for sharpening. You can buy man-made double-sided oilstones with both fine and coarse grit in a single stone. Oilstones can be purchased new for approximately £30. These need to be constantly sprayed or immersed with water to keep the cutting surface wet so that the particles of steel can float off. Available as man-made or natural options, waterstones are well known for hollowing quickly after a short period of use. These stones start at around £40 but require other products to maintain them which then increase the cost of sharpening and maintaining tools quickly. Although this is the cheapest option initially, it is the most expensive option long term. Abrasive paper is readily available, however it is quickly worn down and torn by steel. Wet ‘n’ Dry is a good option as using it wet prolongs the life of the paper slightly because the water prevents the surface from clogging. 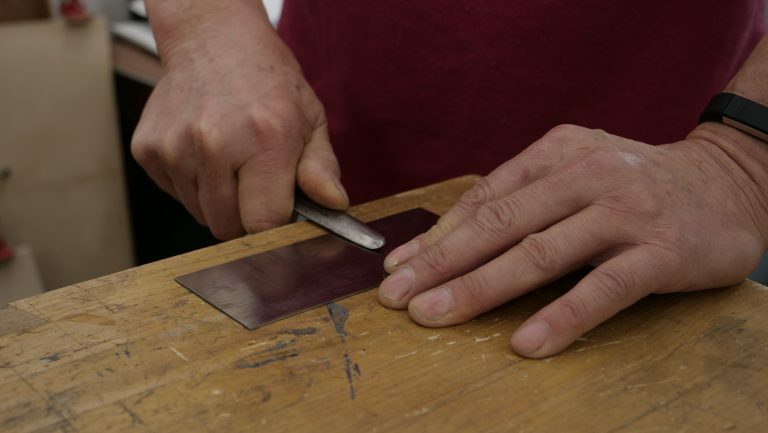 To accompany the paper, you need a solid flat surface to stick the abrasive to; glass, granite or ceramic tiles will work but you should check them for near flatness with a straightedge. Use a light misting of spray adhesive to stick the abrasive to the surface and replace often to keep your tools sharp. These will sharpen your tools fast as they do not wear noticeably, their hard-wearing properties mean they are the most expensive of all the methods. Like the other options, diamond stones need to be kept lubricated throughout sharpening. Three levels of coarseness works well to sharpen blades. Each stone should be a minimum of 3” x 8” to ensure you can fit the largest bench plane blade on width ways. The extra width and length will give you the ability to move the blade across and along the length using longer strokes. The coarse stone should be between 120-400 grit, the fine should be 600-1000 and the super-fine should be 1200-1500. You can make a plate holder to secure the stones in, this will keep them flat, safe and secure, the holder can also fit into your vice. To see how Paul made his, watch his tutorial here. Paul uses EZE-LAP diamond stones. Paul recommends investing in the diamond stones if you are going to be using them long term, if you are just starting out in woodworking and still unsure about your longer term involvement, you might want to stay with abrasive paper as this is less costly to begin with. This is simply a piece of wood which has leather glued to it. This is the final stage to sharpening and although it isn’t totally necessary, it is recommended as you will get the most refined cutting edge possible. 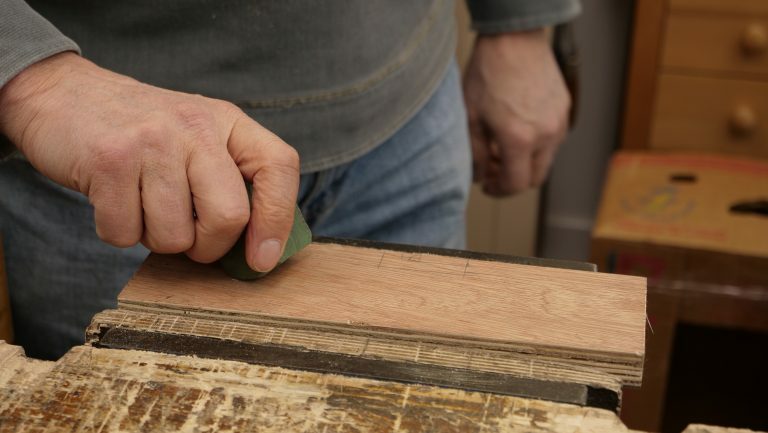 Before using, ‘charge’ the strop with buffing compound which often has a waxy texture. This contains either chromium oxide or aluminium oxide or sometimes both, which acts as a superfine abrasive within the wax. The leather will need replacing depending on how often you use it, but it should last roughly 2/ 3 years. If the leather gets too clogged with buffing compound, you can use the long edge of your chisel to scrape this away. Paul uses Silverline buffing compound which costs approximately £8 for a large block which should last you a lifetime. You can also get buffing compound from any engineering supply house as they use it to polish metals. Veritas also make a buffing compound. Green compound is the one for abrading and polishing hard metals like carbon steel, stainless steel and tool steel. To read about how to make a strop, click here. 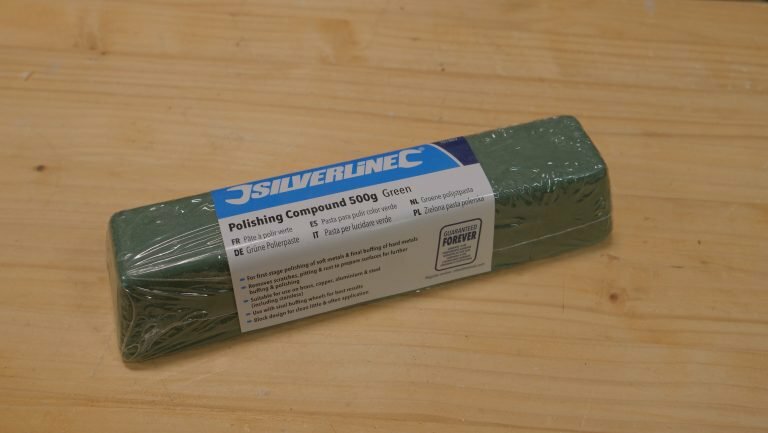 We purchased this Silverline Buffing Compound from Amazon for £6.00. * If you are ordering from the US, we recommend this one from Amazon. Please note Paul has not purchased this, however it seems to fit his recommended criteria. When sharpening a gouge, you can create a custom-made curved strop surface to match that of the gouge profile. You can develop a rounded shape in wood to fit a general radius and this can be used to hone a wider range of gouges. Instead of gluing the leather offcut to the wood, simply wrap the wood and trap it tightly round in the vise. 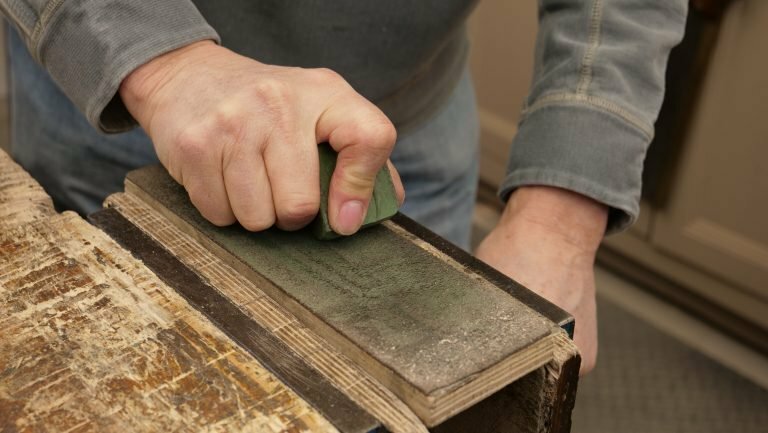 Charge the surface with buffing compound as you would with any strop and use several strokes to remove the burr and polish the sharpened surface. You can use any rounded surface, for example a rolling pin or a broom handle work well. These can come in three different shapes, round, oval and triangular usually with a wooden handle. They are used on scraper blades to create a highly refined cutting edge. The shape you choose is down to personal preference, Paul prefers the oval shaped burnisher. You can use it both single handed or double handed. You can purchase one for around £10-15. 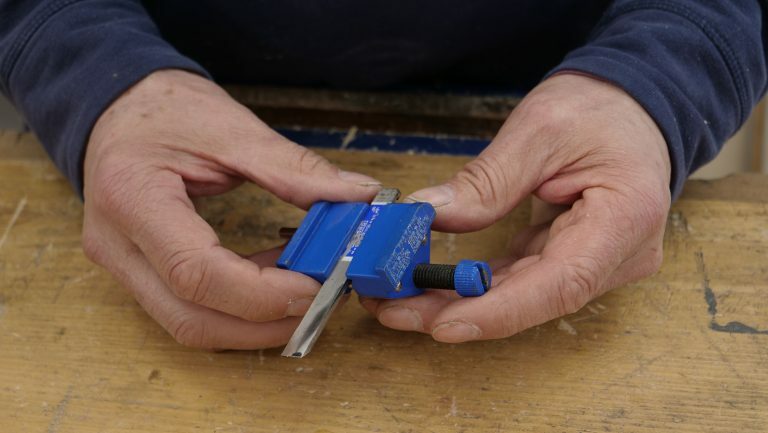 Although freehand sharpening can be quicker, Paul recommends these for beginners to help you reach the required angle when sharpening a blade. The honing guide has the ability to hold a blade of different thicknesses and at any predetermined angle. Use a protractor to help set the angle you want. It is important to not become reliant on this guide and to try and sharpen freehand every now and then to help master the skill. This will prove the most efficient method long term. You can buy a honing guide for £6/7. Paul uses a honing guide made by Eclipse.